Hover to hear me roar! Previous Customer? Refer us and receive $100! 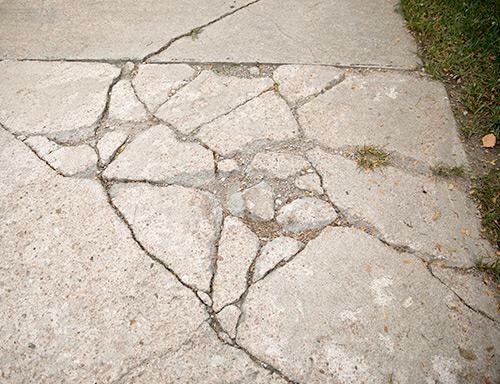 Cracked concrete is unsightly, but not all cracks are cause for concern. Concrete is pretty amazing stuff. It can be poured, shaped and made into just about anything you like. But even though it's incredibly strong, it's not indestructible. So, when you see cracked concrete or a driveway or patio that has sunken or broken slabs or is pitted, flaked and stained, there are reasons why these things happen. The good news is with the right materials, equipment, and help from the experienced professionals at Saber Foundation Repair, concrete damage can be repaired. 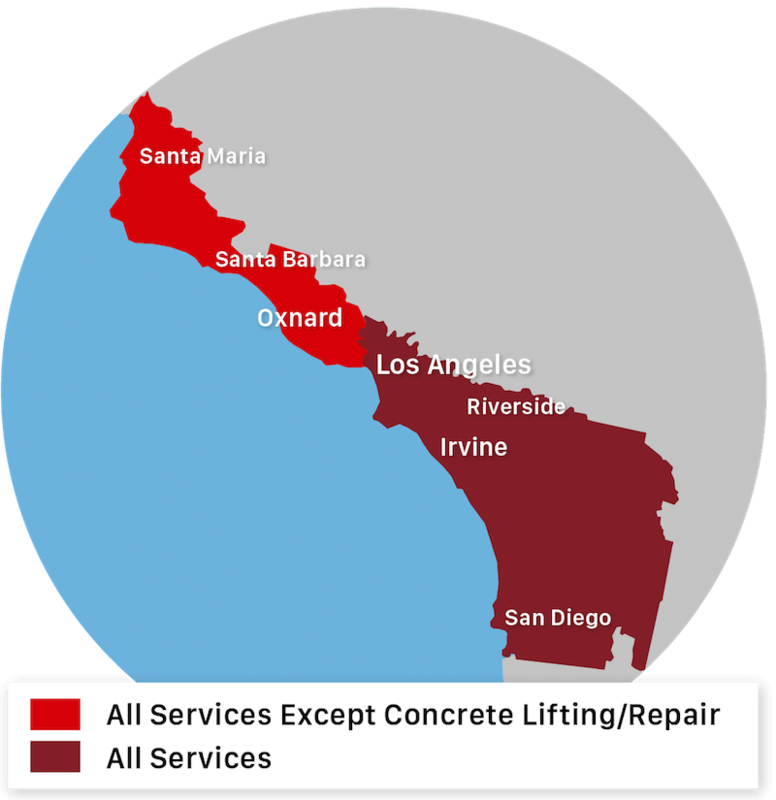 Call us today at 1-877-203-4601 or click below to get a free concrete repair estimate in Los Angeles, Long Beach, San Diego and the nearby areas. Poorly compacted soil: When your home was built, the movement of soil around the building site results in poor compaction. Even when the replaced soil is compacted well, it's never as stable as the original soil. Over time, this can cause voids to form and slabs to settle. Dry soil: Another cause of soil failure is drought. During dry conditions or even just during periods of warm weather and low precipitation, the soil under your concrete will dry out and shrink, creating voids. The concrete above eventually cracks and sinks into these empty spaces; especially if any weight is placed on it. Flooding: When the rains return, the water has an even easier pathway under the slab due to cracks and crevices left over from the dry period. And this wet, soft soil is just too weak to support the concrete above it. In the worst case, the soil erodes and washes away completely, leaving behind large voids that cannot support the weight of the concrete above. When the top layer flakes away, the concrete surface is left patchy and pitted. Moisture is concrete's strongest enemy. It seeps into the pores of untreated concrete, and when temperatures drop, especially during freeze-thaw cycles, that trapped moisture expands as it turns to ice. This expansion destroys the pores and weakens the concrete. This results in concrete slabs that can pit and flake. 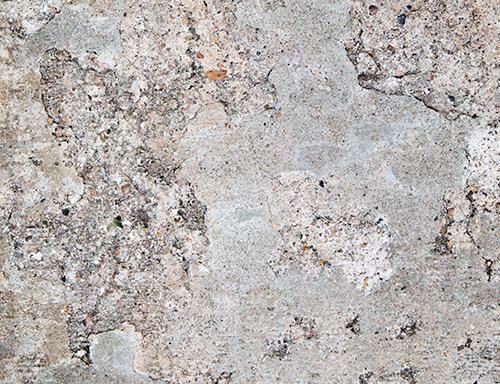 Concrete's porous nature also makes it susceptible to staining when left untreated. As a homeowner, you don't just have to worry about your own concrete slabs; you should be concerned with the slabs that make up the street that goes past your house. During colder months, your street's slabs contract, opening up the joints between them. Those joints then become filled with pebbles and other debris. Then, when the warm weather returns, the slabs expand again - only the joints that were designed to absorb this expansion are now filled with material that won't compress. This leaves the expansion pressure nowhere to go except up your driveway. This "street creep," as it is known, exerts incredible pressure on your home and can cause all sorts of problems. Whatever the cause of your concrete problem, we have an effective solution. Saber Foundation Repair offers concrete leveling for settlement, sinking, and cracks. We will assess your property and recommend the best solution for your driveway, patio, or any concrete slab that needs repair. Call us today at 1-877-203-4601 or contact us online for a free estimate in Los Angeles, Long Beach, San Diego, Santa Ana, Anaheim, Irvine, Glendale, Chula Vista, Huntington Beach, Oxnard and the nearby areas.